What the hell is going on? I have just been listening to FBC and the talk back shows with the Glorious Leader are a disaster. I have never heard so many UHMMs and AHHs in 60 minutes in my life. You told me you had a full proof plan and the only questions Bananas would have to answer were going to be calls and emails from CoreVice. If that was the case which one of your miserable spin doctors was trying to ask the Glorious Leader how much he was paid? You need to sort it out. If the Commodore is ever going to make the transition from Military Thug to eloquent politician we need to make these plans work. I don’t think you have been concentrating on your work this week Grubby. You have become obsessed with Professor Marc PushYouOverTheEdge. You accuse him of being behind every anti-Goernment article or comment ever written. That is just GrubbySplutter. Concentrate on promoting the Dictator and turning him into a politician and forget about the Canadian Professor or you will lose your job. This BK Constitution wheeze is just so brilliant in its simplicity. It would have been so much harder if we had kept to the original plan with our own appointed Constituent Assembly making whatever changes to the Ghai Draft we wanted. Trying to justify the changes in public would have been a nightmare for the Regime. Frankly it is impossible for Bananas himself to justify anything without using violence. This way, we have changed it all behind the scenes, and thrown the onus on the people to oppose the changes. Most important, we do not have to respond to the public at all, just as we have not responded on many criticisms and demands by the public- such as for the Auditor General's Reports for the last six years, Reports on FNPF projects, transparency about Ministers' salaries, etc. Grubby as you know I am in this for the money, the prestige and having my picture in the paper. Whereas you describe yourself as “A true believer and not a Spin Merchant” I need to try and understand why you are a true believer and how you know what to believe. If I can understand your psyche then I will be able to make many more converts to the Way of the Banana. So I am going to play the Devil’s advocate and put a number of Banana’s lies and broken promises to you. I then want you to explain to me how, knowing they were all lies, you still consider yourself to be a True believer. Frankly Bananas was going to reduce the Bananas’ Republic debt levels from the unsustainable levels reached by the democratic PM LiceintheHair GarySay. GarySay increased the debt from $1bn to $2bn between 2000-2006. Bananas has increased the debt from $2bn-$4bn in the same period of time. In effect he has borrowed at 2x the rate. And then you add in a couple of other small debts the Regime has guaranteed like $1.2bn for Air Pacific to buy its newTour Buses. We have no idea how many 100’s of millions of dollars we have borrowed from the Chinese. The FSC debt. And then there is the $1bn for WhyTheHell City. Everyone in Fiji knows that is one dodgy deal. At least the company behind it is honest enough to let everyone know it is a con job by putting it in their name Top SymPHONY. At the end of the day the Regime is in debt for between $7-8bn. That is 4 times the unsustainable level of GarySay. 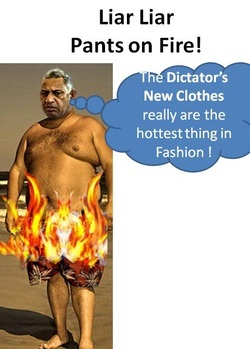 In its place he is trying to force the people of Fiji to accept a constitution to allow A Bunch of Bananas to run the Bananas Republic for 1,000 years. He might have ended GarySay’s nepotism but he has more than replaced it with his own brand. He has sent his brother off to be Ambassador to Malaysia even though he should have retired at 55 as decreed by Bananas for all Civil Servants. His brother in Law Francis Keane was convicted of killing a relative by beating him to death. He received full navy pay whilst he was in prison for a few weeks. Bananas then was keen to break the law and appointed Keane firstly as commander of the Navy and then as a Permanent Secretary in the PSC. Both organizations have a rule that they cannot employ Jail Birds. But Princess Litiana hit the jack pot where she is CEO of the FSC (Family Support Centre). But the Princess has nothing to do because that old Queen Maisie is employed on the same salary to do all the work. The military is the only group in the country to have had regular pay rises since the coup. If you remember back in 2007 all Regime employees had to have a pay cut except for the soldiers. But look at all the officers driving around in their 4x4s, their regular drinking parties, their free housing. Everyone else in Fiji has to pay a benefits tax but the soldiers pay Zero. As they like to toast in the officers mess “My CoUP runneth over.” The Glorious Leader with his 8 ministerial salaries and his kick backs on all the untendered Government projects will be unable to pass his own rules to enter politics under the new BK Constitution.